Ever wondered what ATVs (quad bikes) and UTVs are and/or thought they were the same thing? UTVs/side by sides are also off-road vehicles but can seat between 2-6 people depending on the model, and they’re designed for rougher terrain, hauling, and more work horse sort of tasks. UTV stands for utility task vehicle. Sometimes, you might hear the term SSV, ROV, RTV, XUV or MUV. All of these terms are referring to side by sides. ATVs you straddle like a saddle to ride. UTVs you sit in bench or bucket seats. ATVs steer using a handlebar system. UTVs have a steering wheel similar to a car or truck. 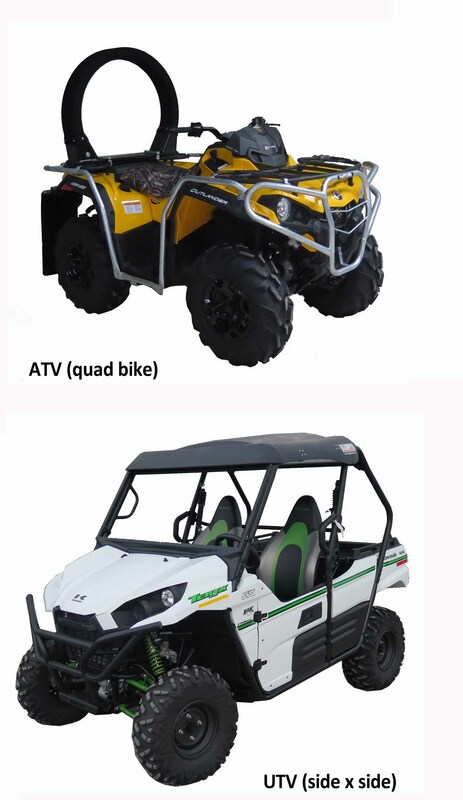 UTVs mostly come with full roll cages which Windscreens and Roofs can be attached to, where as most ATV quad bikes don’t - you can fit aftermarket protection devices like the LifeGuard to quad bikes. Both vehicles are great for various jobs, and it's important to chose the right one for the right job - UTVs are harder to get out of in the event of an accident and ATV quad bikes are easier to roll.